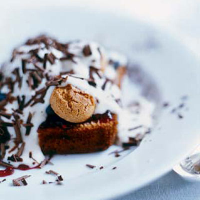 "For the sponge base in this simple but decadent pud, I use a good Madeira cake or - even better - a homemade sponge." Take a pretty glass bowl and layer the sponge on the base, spread with raspberry preserve and scatter over the crumbled ratafia or amaretti biscuits. Slosh on the sherry and allow it to soak into the cake. Strew over the thawed raspberries. Meanwhile, make the custard. Heat the milk with the vanilla pod until just below boiling point; remove from the heat and leave to infuse for 10 minutes. In a heatproof bowl, over simmering water, beat the egg yolks with the sugar and whisk until starting to thicken. Remove the vanilla pod from the milk, add the milk to the egg mixture and continue to cook until the custard has thickened. Leave to cool, then pour the custard over the fruit and sponge. Whip the cream into soft peaks and spoon over. Decorate with the chocolate.